Large chamber size of autoclaves and sterilizers. Medium sized autoclaves are manufactured with a larger chamber size, maximizing the operator’s productivity by sterilizing a greater amount of heat and moisture-stable items. Manufactured with the same sleek design and user-friendly controls as the smaller units, the medium sized models provide the reliability and efficiency you come to expect from Tuttnauer. Multiple cycle options (vacuum,gravity, liquid) come standard, with a full temperature range. Bulk line of autoclaves are designed to handle the most critical sterilization processes, utilizing a liquid ring mechanical vacuum pump for pre/post vacuum capabilities. Offered in a wide range of custom sizes and door configurations, these models can be tailored to meet the demands of any facility. The bulk line is manufactured with unparalleled quality and dependability, primarily used in the Bio-Technology, University and General Laboratory markets, as well as Animal Care Facilities. Multiple cycle options (vacuum, gravity, liquid) come standard, with a full temperature range. Large line of autoclaves serve as standard equipment in Laboratories, Hospitals, Animal Care Centers, and High-Containment Facilities. These models operate with saturated steam as the sterilization agent and incorporate the same techniques as our other models. Typical laboratory applications include liquids, fabrics, surgical instruments, and utensils. 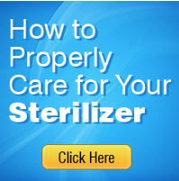 The end user has the ability to select from a wide range of steam sterilization programs and test cycles, meeting the needs of any marketplace.